New Holland Agriculture presented today at the Farm Progress Show the latest development in its vision for the sustainable future of farming: a concept tractor powered by methane or compressed natural gas (CNG) that reimagines the design of this machine and reveals a connected future. The brand imagines the farm of the future as being completely energy independent: a farm that produces not only food, but also the materials it needs to generate the energy it uses to run its operations and power its tractors and other machinery. New Holland has been pushing the boundaries of innovation in clean energy solutions for more than a decade through its Clean Energy Leader strategy. It was the first manufacturer to offer 100% compatibility with Biodiesel back in 2006. In 2009, New Holland developed the world’s first hydrogen tractor concept, NH2 TM proving the feasibility of this zero-emission technology for the future. This was a key element of the brand’s Energy Independent Farm™ concept, launched at the same time. New Holland continued to explore alternative fuels that would deliver reduced emissions and lower running costs. In 2012, it created its first propane fueled tractor prototype and is now developing the T6 Propane Power tractor in partnership with the Propane Education & Research Council (PERC). The methane powered concept tractor: the performance and durability of its diesel equivalent, with up to 30% running cost savings. The new methane powered concept tractor builds on the foundations of the previous T6 Methane Power prototypes to achieve a significant technological advance. It features a powertrain that uses a pioneering efficient combustion technology specifically developed for agriculture applications by FPT Industrial, a brand of CNH Industrial that has pioneered natural gas traction for the past 20 years. The 6-cylinder NEF engine develops 180 HP, with the same power and torque as its standard diesel equivalent. It also has the same durability and service intervals, and generates up to 30% running cost savings. The innovative tank design, using a composite layered tubular structure, enables a full day’s autonomy in line with an equivalent diesel model. 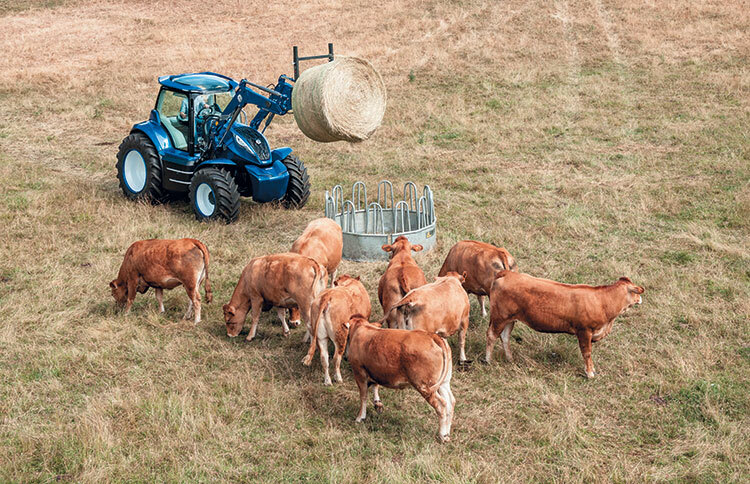 The powertrain of the methane powered concept tractor has the added benefit of quiet operation, with engine noise level reduced by up to 2-3 dBA. This translates to around 50% reduction in drive- by-noise, which makes it ideal for municipality, yard and transport operations. In real field conditions, the methane powered concept tractor produces at least 10% lower CO2 emissions and reduces overall emissions by 80% compared to a standard diesel engine. Its environmental performance further improves when fuelled by biomethane produced from crop residues and waste from farm-grown energy crops, which results in a virtually zero CO2 emissions profile. This is how the methane powered concept tractor forms a vital link in the virtuous cycle that delivers CO2 neutral production, where the Energy Independent Farm™ produces the energy it needs to power its operations, heat farm buildings, and run its equipment. Biomethane as a sustainable fuel is particularly well suited to farms, as they have the raw materials and the space to house a biodigester to produce the gas. The biodigester is fed with specifically grown energy crops, animal waste, food waste, or crop residues. It can use waste collected from food factories, supermarkets and restaurants in addition to the materials gathered at the farm. The biogas produced in the biodigester is transferred to a refining station where it is transformed into fuel-grade methane to power the farm’s vehicles and machinery. The methane can also be used to fuel a generator to produce electricity that can be used on the farm with any extra fed into the electricity grid to power local communities. The by- products of biodigestion can be used as natural fertilizers on the farm’s fields. The wrap-around bodywork is a perfect illustration of a fully integrated design approach with the hood, front and rear fenders, and the fuel tank creating a flowing, stylish look. Wrap-around glazing provides 360-degree visibility, with a 20% increase in the glazed area compared to a standard tractor. The floating glass domed roof with fully integrated Precision Land Management receiver provides a completely panoramic design – an agricultural first – and offers an unobstructed view of the loader at all times, facilitating operations, from loader work to feeding cattle. The interior of the cab offers a clutter-free operating environment, with all essential controls on the integrated armrest and additional controlled accessible through the interactive headliner display. The fixed hub steering wheel-mounted display cluster moves with the steering wheel when it is raised or lowered to accommodate for the size of the operator, ensuring optimum visibility on the display information in all positions.